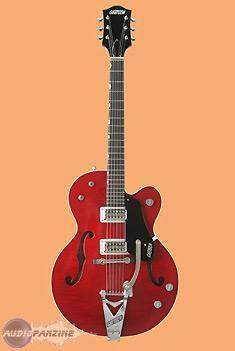 Is it just me, or does this look “Gretschier” now? Back in the day I switched out Witch Hats for Speed Knobs on my LP, but I do prefer Bell Hats! Not really, no. Good try, though. Maybe not Gretschier, but definitely "Wompier." Ok, just more reminiscent to me of my similarly garbed Pro Jet. Well, that would be a personal association that works for you through transference. Maybe if we saw it next to that Jet we'd get a sense of the kinship you find. Or maybe we'd just say, "oh look. Black & gold. Hi Sam." Also, you realize a few years down the road you're going to be disgusted at the condition of some of your gold hardware. It's the nature of that beast. Just forewarning. Enjoy them now. It’s just you Sam, but my Country Club is looking decidedly Gibson-like in and about the pick guard area. Can I...take that as a “no”? Thank ya for the heads up. I’ve read about that before. Yeesh! Only use a clean, soft white cotton cloth...one simple quick wipe...nothing more. Well okay. Nice color combo but Bob’s looks more Gretschier. Sure can’t argue there. Beautimous, ain’t she? My little Epiphone tries very hard, bless it! I love vintage Gibson archtops, because I'm not, you know, a total ignoramus and idiot...despite my best efforts. But there is nothing gibsonesque about those f-holes. The f-holes on clubs and 6120s (and most falcons and annies) are the most elegant in the world. I wish they made a t-rose with these f-holes. The 6119SP has them unbound, which is fine with me, more understatement isn't necessarily bad, but they don't make it anymore.